Easter Games for preschool through school-aged children. To focus on following directions, have an Easter basket full of different kinds of plastic eggs: shimmery, pastel, spotted, bright, gold, silver and of different sizes. This will also help little ones learn how to comprehend and use descriptive words. 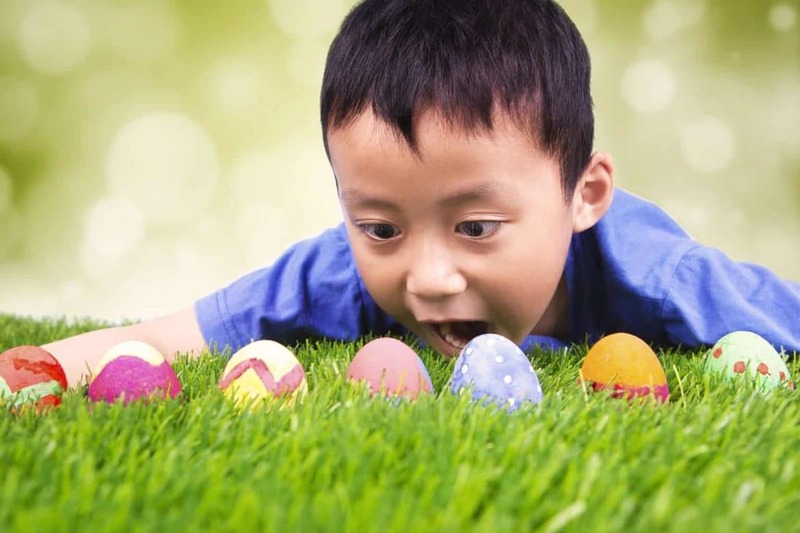 Give each child an egg or you could have them find the eggs during an egg hunt. When each child has an egg, orally present directions such as everyone with a big egg, hop three times. You may want to present a mini-lesson on all of the descriptive words before you start the directions. As a reward for each correctly followed direction, each child may receive a jelly belly or whatever you’d like to give. To work on description skills, ask each child what kind of egg they have. If they don’t answer, ask them yes/no questions; such as, Is it bright and big? Recognizing names – write each student’s name on a plastic Easter egg (have more than one egg for each child). Hide the eggs outside, have your students find the eggs, read the name and give the egg to the correct person! Don’t forget to write the teacher’s name on a few eggs! This activity can be played at circle time. Buy those Easter color plastic eggs. Hide items around the room like tiny blocks or stamps inside them. Have each child take a turn shaking it and then ask them what they think is inside. Then when each child is done taking their turn show them what is inside.. Children love this game. It teaches them to take turns and it also gets them thinking. I play Bunny Bunny Rabbit. The way it is played is everyone sits in a circle. Someone stands up and goes around naming you Bunny or rabbit. If you are rabbit, you hop around and sit in your seat. This is played like DUCK DUCK GOOSE, but instead of running, it is hopping. Play the game Colored Easter Eggs. Have one child be the fox, the teacher be the grocery attendant, and the other children be the eggs. Each child picks a different colored egg to be and tells the teacher their color, then the fox asks the grocer for a “red” egg. The “red” egg then runs for base. If the color is not represented by a child the grocer replies “Sorry we’re all out of “green” eggs today.” There are no winners to the game and the children get to practice naming their colors. My class had a lot of fun making egg hunt collages. First, they each drew a basic landscape (grass, sky) on a large sheet of paper. Next, they cut and glued pictures of outdoor objects — trees, cars, playground equipment, dogs, etc. — from magazines to complete the scene. Finally, they drew the Easter Bunny with crayons and glued on dyed shell macaroni “eggs” all over the landscape! For some reason, this project really appealed to the four-year-old sense of humor! They really enjoyed getting to be the ones to “hide” the eggs! This is for our home but it would work anywhere… we make 3 dozen eggs (we have 3 kids)… we give each kid a specific color to look for.. but none the same…The kids have to only find their color egg but if they see another color egg they can’t tell the kid with that color.. this is really nice because it reinforces colors and each child gets the same amount of eggs. Its allot of fun! For our Preschool Easter Celebration I have put together a fun game called “Wash the Jelly Beans”. I took 12″ brightly colored balloons and mounted them on foam core board that I had cut slits in and pushed the balloons onto the board. I had marked a firing line with surveyor’s tape and had them stand behind it. Then I let the children select a water gun and fire away at the balloons. This was their favorite activity. Draw an Easter egg. Mark the different sections on the egg with decorative lines, in these six sections of the egg put the numbers 1 to 6. Make a copy of the egg for each of the players. Get a dice. The children throw in turn. When they have thrown a number they can put a counter or mark on that section, obviously if they have already thrown the number 2 they do not want it again. The first player to cover their egg with a counter in each section is the winner. Have an adult place a basket on a tree outside. Give each child a plastic egg. Mark a line for each child to stand (don’t make too difficult)….Each child will then try to throw egg into basket. Bowling Contest Host an Egg “Bowling” contest: color some hard boiled eggs and leave one white. roll the white one into the center of a room and take turns to see who can roll their colored egg the closest to the white egg.